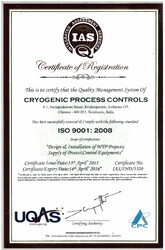 Established in the year 2010, we, Cryogenic Process Controls, are counted among one of the top-notch Manufacturer, Exporter and Trader of Scientific Measurement Instruments such as Water Treatment Plants, Flow Measurement Instruments, Liquid Analysis Measurement Instruments, Level Measuring Instruments, Temperature Measurement Instruments, Pressure Measurement Instruments, Diesel Flow Meter, Liquid Dispensing System, Waste treatment system, Online Monitoring Instruments etc. The offered products are designed and manufactured using quality-tested raw material in adherence with the industry quality standards. Our products are applauded in the market for their features such as longer life and resistance against corrosion. Being a client-oriented firm, all our endeavors aims at maximizing the satisfaction level of our valued clients. The products offered by us are stringently examined by a team of quality controllers on various stages. Moreover, we are supported by a team of adroit professionals, which assist us at all the stages of our business processes. The professionals appointed by us work in close consort among themselves as well as with the patrons to fulfill their needs & requirements. Owing to the client-centric approaches and ethical trade practices, we have been able to spread our wings across the markets of Australia/NZ, Indian Subcontinent, South/West Africa, East Asia and Middle East. Under the visionary guidance of our manager, 'Mr. Dharmendar', we have been able to stand ahead of our industry counterparts. His brilliant managerial skills and constant inspiration have enabled us to reach the pinnacle of success. A sophisticated infrastructure facility is developed by us, which spreads across a vast area. The infrastructure of our firm is installed with all the necessary machines that are required for smooth production. Owing to the large production capacity of our infrastructure, we have been able to meet the bulk orders of our patrons within the postulated time-frame. Moreover, all the tasks of our infrastructure are efficiently managed by an experienced team of professionals. We have been able to maintain a prominent position for ourselves in this highly competitive market due to our rich contacts with varied manufacturers of the market. For products procurement, we have joined our hands with various reputed manufacturers. The vendors we are linked with make use of high-grade raw material and advanced technologies to manufacture the offered range. Moreover, the vendors we are associated with, are selected by our team of procuring agents after conducting and analyzing the results of variegated surveys. We are supported by a team of diligent professionals, which helps us in accomplishing all the stages of our trade. The employees of our firm implement their vast industry knowledge and experience while carrying out the business activities. Our professionals are ever ready to face and tackle any situation under pressure. Moreover, our professionals work in close-coordination among each other to meet the organizational goals and targets. Regular training sessions and seminars are also arranged by us to keep our workforce abreast with the advancements in the field of technology.